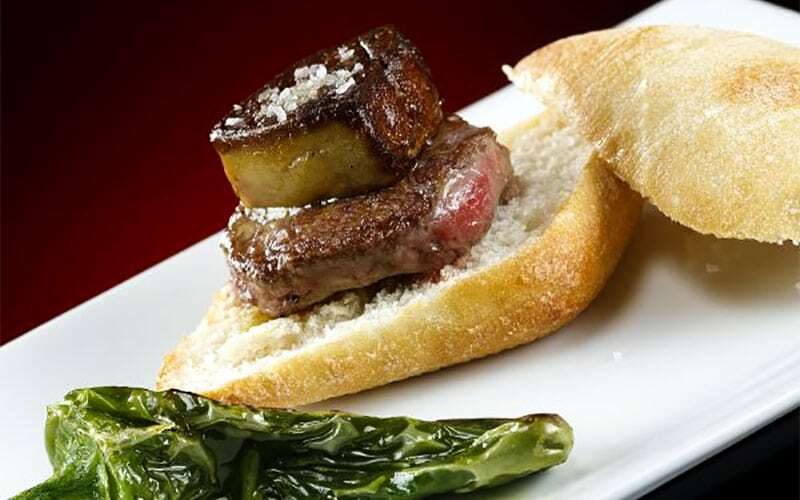 Pintxos in Bilbao are appetizers that you can find in the bars of bars and restaurants of all Euskadi. 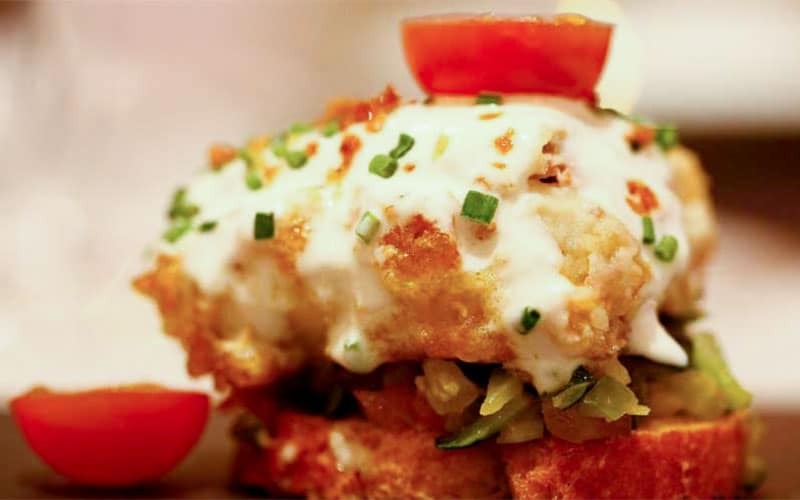 The Basque Country is the birthplace of pintxos and new creations are becoming more and more elaborated. Did you know why they are called this way? The tradition marked that the product was held to the slice of bread with a toothpick so that it did not fall. 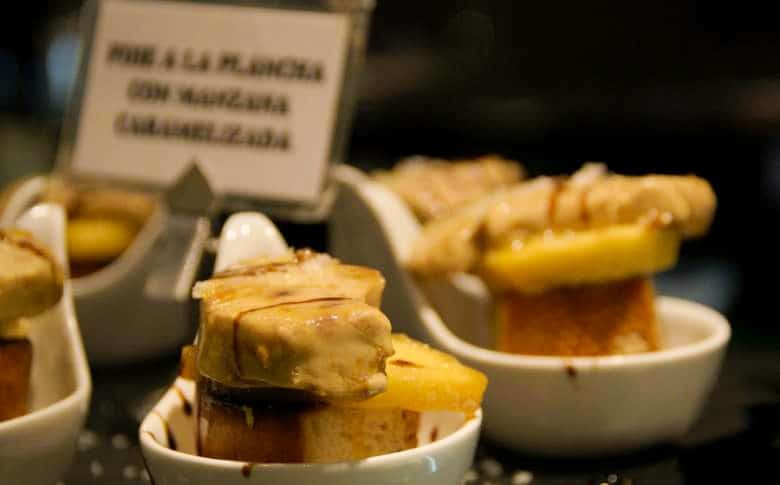 Currently many pintxos in Bilbao do not use them anymore because they are not necessary. If you have decided to eat pintxos in Bilbao, we have some suggestions to make the most of your experience. First, and maybe the most difficult one: even if you want to try all the pitxos of the bar, keep calm. If you want to eat like an authentic person from the Basque Country, don’t eat with your eyes. 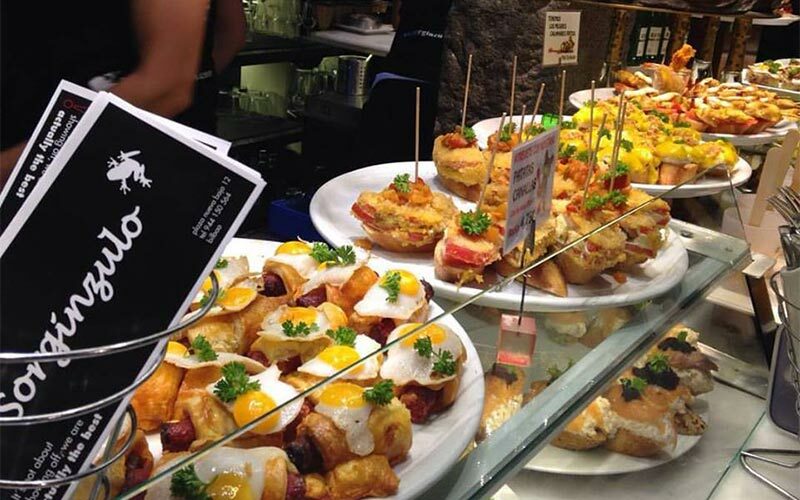 Bars are full of appetizing pintxos but the typical thing is to go to some taverns and try 1 or 2 pintxos in each one. In addition, although their size can deceive, they will make you be full. In second place, do not throw out the toothpicks. Some bars calcúlate dcpending on the toothpicks that were used to hold the pintxos. According to their lengh or the colour of their top (if they have them), los pintxos in Bilbao will have a certain price. In the heart of the Casco Viejo of Bilbao, you can find the Sorginzulo tavern. It is situated in Plaza la nueva and some of its specialties are the monkfish and prawn brochettes and the ham croquettes. It is a tavern where you can try delicious thanks to their balance among innovation and tradition. 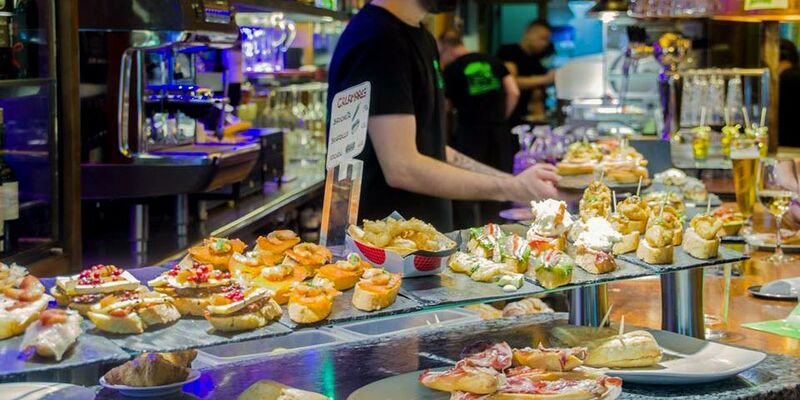 Its bar with different types of pintxos will make you fall in love. Mini pink burgers, kokotxas of pil pil and txakoli, fajitas of Iberian flesh of the jaw, guacamole and cream of sweet potato, cod fritter with crunchy potato… Recipes are very varied as you can see. With the application of techniques of avant-garde culinary techniques, Casa Víctor Montes, situated in Plaza Nueva too, is a restaurant with a lot of history: from its collection of whiskeys, wines and cognacs to the portraits of those illustrious people who have visited the establishment that decorate the walls. But the most important thing is its famous bar of pintxos. Full of colour and savour, pintxos are elaborated with gourmet products that give rise to outstanding results. Santamaría is the typical tavern where you can try some pintxos in a nice environment. With a simple and fresh decoration, its bar is full of specialties such as the foie with caramel coated apple. You cannot miss the variety of grilled meat and fish with the shape of pintxos, such as txurrasco or grilled monkfish. In its bar you will also find creps stuffed with deer, sirloin with Idiazábal cream, caramelized goat cheese with tomato… You will not be able to resist. Irrintzi is situated in Casco Viejo, concretely in one of the busiest streets, Santa María Street. Its funny mural will surprise you as well as its recipes that combine local recipes with specialties from other countries. 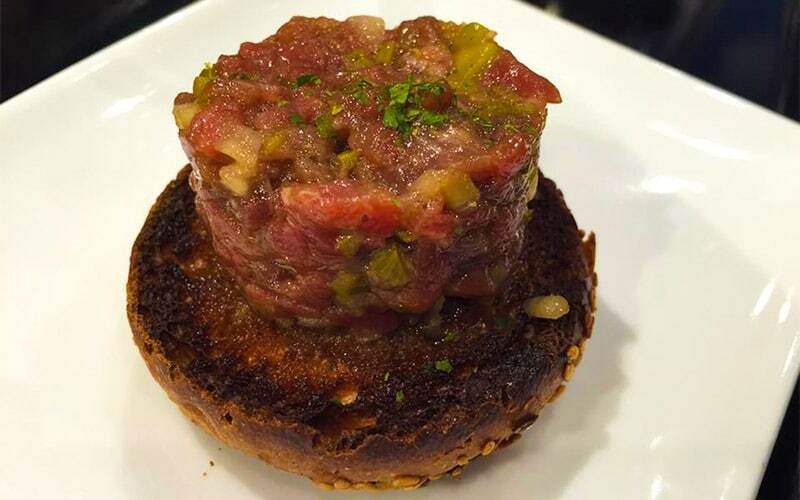 Eating in Arrintzi is a way to try pintxos in Bilbao betting on a sure thing. 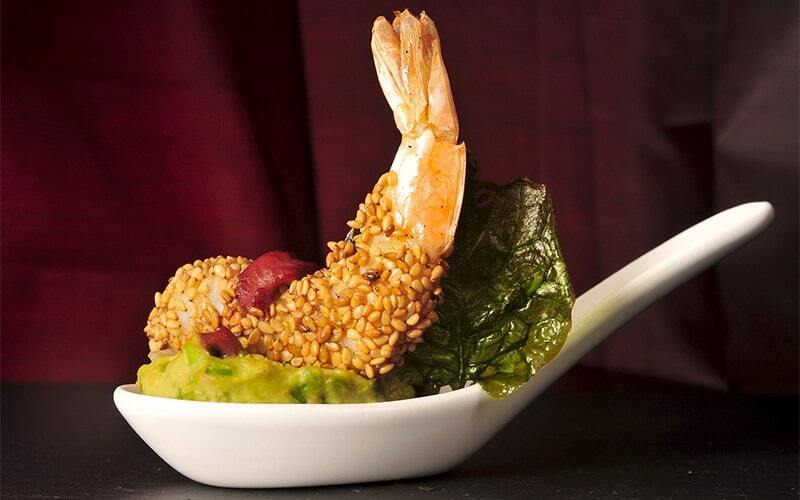 In addition, the presentation of the pintxos is carefully prepared and they will not disappoint you. We recommend the box of swordfish and prawn with garlic mayonnaise, the baby cuttlefish with wakame, the cannellone with tofu salad and Galia melon, the cod ping-pong… You have lots of possibilities to choose. This tavern is so popular that it already has three restaurants and in any of them you will find a long bar of pintxos. There are 32 pintxos: cold ones, like courgette with egg and chili pepper; and hot ones, like the sirloin medallion with grilled foie gras. The octopus and prawn brochette and fried calamaris are some of its specialties. With an up-to-date decoration, Berton has been cooking typical pintxos of Euskadi in Bilbao. This pintxos tavern in Bilbao offers a great variety of recipes for all tastes, also for vegan people. They have morning pintxos, like cod brandade, deer marinated with txakolí, smoked salmon and courgette roll and the steak tartare (the specialty of the house); and evening pintxos, as coated potatoes stuffed with pâté, black pudding ommelette or tomatoe stuffed with Iberian ham and cheese. Gatz is a pintxos tavern in Bilbao with an original decoration where you can spend a good time.